planning & buying.To push the boundaries of achievement with traditional, digital and innovative media. India's full service media planning and buying agency. Get the share of voice from the people listening. Connect audiences in 70 mm silver screen. Put your business idea into paper and ink. Catch the attention of a naked eye. We have a large and diverse list of clients. We have the experience that is needed to solve your problems as we can establish a strategic approach to achieving client goals. You can even pick from our diverse list of cost-effective solutions and campaign ideas to see what fits best to your needs. We combine strategy with in-depth analysis of audiences, markets, and media. We apply our experience and expertise to interpret data and to make recommendations for your buy. The research we conduct ensures that your buy is extremely targeted. We take into consideration your objectives and target market. We take the time to learn which media is most likely to engage, find hidden value in placement opportunities, and evaluate factors beyond what a database can tell, such as competitive and industry trends. Then we plan a strategy accordingly and execute the campaign with aim that all the objectives are achieved and that the campaign is cost-effective. We at MPlan Media offer a complete end to end solution for creating a campaign targeting your objectives, whether it’s building awareness, growing revenue, or entering new markets. 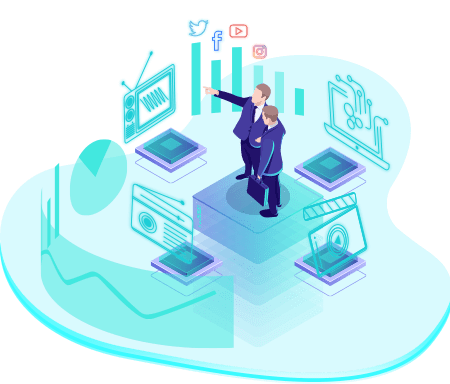 We help all from businesses new to big campaigns that are ready to reach their audience to the companies experienced in media that want more than their current provider offers. We handle every aspect of the media campaign, from strategy, planning, and research to buying, analysis, and optimization. We make sure that our approach is understood; manage the campaign through every stage; and optimize tactics at every opportunity. Data and analytics have become the foundation of marketing, driving efficiency and effectiveness through better data collection, modeling, optimization and greater relevance to the consumer. An effective marketing analytics operation aligns to the brand’s strategic business goals. We at MPlan help you reach your consumers by harnessing data and analytics in the most effective ways. We chart the path from data-driven insights to help make your campaign a success. There are many agencies you can choose from to suit your needs, but the difference with MPlan Media is that we are a one-stop-shop, offering everything to suit your needs. Our affordable solutions are innovative, efficient and proven to work over time. You can hire us for the entire campaign or pick which service you need the most and then adding on from there if you’d like. Once your business is all set and rolling, and if you want, we can stay and help you throughout. We’ve been serving with full-service solutions, and we continue to help businesses drive traffic and increase revenue. With offices in Mumbai and Bangalore, and affiliated offices in Delhi and Calcutta, we cover most of the important media outlets. MPlan targets, engages, and acquires audiences with effective media solutions throughout the nation depending on the client’s objectives and needs. A deep understanding of local behaviours helps MPlan deliver actionable results with all the media buys.